"There's no one left. Soon I will stop. 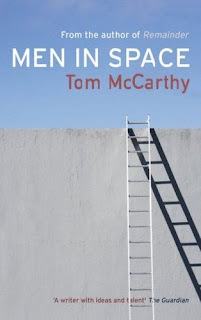 Soon ..."
Tom McCarthy's second novel, Men In Space, is a masterpiece. A painting on the white wall of a gallery that opens itself layer upon layer as you inspect it. And there lies its greatest weakness. For it is a novel that by the very nature of reading spans days, weeks, months depending on the speed of the reader. For whilst a painting can be observed in one glance and then explored whilst remembering the image as a whole, Tom's book fragments into separate satellites that orbit around each other obscuring the overall image. The reader becomes lost, disorientated. And as each satellite moves majestically through space following perfectly formed trajectories, under Tom's masterly use of words, the story stays elusive. "It could be any space. It could be a hospital room, a lecture hall, a street or a sky beside a mountain, like where the saint is in that picture. There's no essential difference: you've got a space, and then a person in it." I tried reading the last third of the book in a couple of sittings and was then able to see the beauty of the silent interlocking orbits of the satellites that Tom follows. "-watching it mute gives it a quality it never had originally - a rich, alien feel, as though the characters were living in some kind of outer space." So what are those satellites? A stranded astronaut who has no country anymore to bring him home. Anton Markov: A football referee with connections with Bulgarian gangsters. "So now they're halted, slowed down by this weight she drags behind her like the moon drags all the oceans." The manner in which Tom does this is astonishing. If you like your books light and frothy, whilst drinking in Starbucks then stay away. But if you like your literature to take you past the cake counter and cappuccinos and up through the ceiling in majestic arcs until you reach a space where fictional lives encircle you as you loose yourself to their silent rhythm, then pick it up and step through. 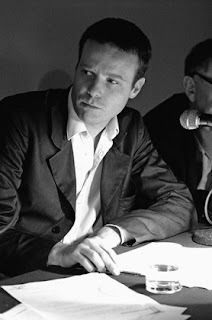 Tom Mccarthy was born in 1969 and lives in London. He has also written TinTin and the Secret of Literature, a non fiction book. I guess you convinced me to read this book. However, if I have to read your post two or three times just understand it, I can't even imagine how many times I'm going to have to read a book that you recommend(lol). Nice article. I enjoy reading your writing. Have a nice one. Thanks and thanks for dropping in again. I have to be honest I had two false starts reading this book, but managed on the third time and am really pleased that I pushed through as the reward was huge. Your review intrigues me, Mike, and I might give the book a go sometime on the strength of it. Sounds like the storyline/structure might be a tad challenging though, so good to be prepared. Thanks. Hi Paul, thanks for dropping by. 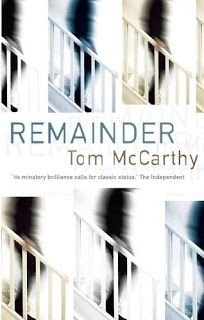 Tom's first book Remainder is an easier stepping on point to his style if you are daunted! Okay, will take that good advice. Cheers, Mike. I know this book is on Alma, but it's strange that it's not also available on Amazon. I usually have a problem reading books without chapters. I know - read the whole thing in one setting. Okay. But I'm not ship wrecked. I'm sitting here in my living room with a million other distractions that compete for my time. You know how it is: sleeping, watching TV, blogging, day dreaming - all the usual suspects. I liked your writeup, though, and I plan on being a regular visitor at your blog. Keep up the good work. Glad you like it here, look forward to seeing you around. and yes re Men in Space it's strange it's available on the UK Amazon site but not the US site. "Therefore I recommend you get shipwrecked..."
Priceless. They could make greeting cards with, "Wishing you a shiwreck's worth of relxation!" Men in Space: Available on all good desert islands. You know Mike, reading your reviews takes Bridget back to high school days, times when she truly rejoiced in prose and poetry. Thanks for bringing back beautiul memories Mate! Hiya, glad I could bring the memories back. Remember reading can still be that beautiful pastime. Go read some of it Bridget and feel alive. I'm including your blog on my list of Very Important Sites. Swubird: Wow thanks I'm honoured. Ace - heh Bridget, maybe you could do a guest review then and e-mail it to me and I'll post it up here on the blog! There's a thought! I'll try to do that Mike :) Bear with me a little time wise though, it's a hectic week ahead at work and I may not get a chance to make any reading progress on Croc Blanc till next w.end. Okay Bridget, see you around later at Flowers.